Miller's exquisite depictions of the country of the Queensland highlands form the background of this simply told but deeply significant novel of friendship, love, loyalty and the tragic consequences of misunderstanding and mistrust. Coal Creek is a wonderfully satisfying novel with a gratifying resolution. 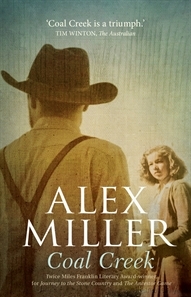 It carries all the wisdom and emotional depth we have come to expect from Miller's richly evocative novels.